Good news for Fates and music fans! On 27th April 2016, Nintendo will be releasing the Fire Emblem if (Fates) Original Soundtrack in Japan in partnership with Tablier Communications inc.
Like the official Awakening soundtrack that came before it, Fates’s soundtrack comes in a beast of a package. For starters, it contains all 134 tracks from the game across 7 CDs and includes a bonus, bumper-packed DVD. 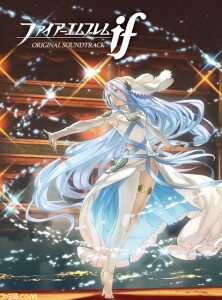 Similarly, Yusuke Kozaki–the artist of Awakening and Fates–again provides the glorious cover illustration, this time depicting Azura’s iconic performance at the Opera House. The goodies don’t end there: First-print copies of the soundtrack will be bundled with a pair of those increasingly popular can badges featuring male and female Corrin. Note: Songs denoted with an asterisk (*) do not have an official translation. 05. What Can You Do? 04. How Can That Be? I can neither confirm nor deny my anticipation for this. Uh, as with any Japanese soundtrack, it’s just the Japanese tracks. Oh ok thanks I’m hoping for a US one soon. To be honest, I wouldn’t hold your breath. Games rarely release soundtracks in the west. Alright thanks maybe I will pick this up then I love the soundtrack regardless. You can probably import it, but it’ll leave a 6800 Yen + shipping hole in your wallet! Where can we preorder this from? I don’t think it’s up for preorder anywhere quite yet. I didn’t see it on my usual locations for importing. I didn’t check Amazon JP, but you probably can’t import it from there without a mail proxy. CD Japan! They are amazing! Oh no, I can already feel the pain in my bank account… But I HAVE to get this! I need this. Also, is there any new on the Live Orchestral DVD? When will that be out? It should have released on 24th February, assuming there were no delays. this abysmal stock especially since you cannot buy imports from amazon.jp. You actually can buy DVDs, CDs, and Books from Amazon.co.jp if you’re an international customer. Just not really anything else. They only have express shipping though, but considering it usually starts at CD Japan’s SAL prices… Regardless, their listing still hasn’t started accepting preorders yet. I pre ordered this on amazon but im debating on whether I should wait to see if it gets an English release because it will have the Japanese singers and while I do like them I do prefer the dub singer what do you think? If you can afford it, get both. FEA soundtrack sold out super quick and was on eBay for $300+ before they re-released it, so don’t take any chances. If the English one does come out, then perhaps sell it. I’ll probably get both, I reckon they’ll do an English one. I love this so much! It contains 134 songs from the first 7 discs, then another 100+ as well as movie file son the data disc. Perfect for a collector and huge fan of the series! I think the track list is actually incorrect. I have the soundtack here and there are 19 tracks on the 7th disc. The last track on the booklet says it is the ENISHI track. Just wanted to point that out. It isn’t missing, it is just misplaced. However this post is missing about 100 songs on the bonus DVD in the instrumental and Ver.AC folders. That is true. I am frankly in awe of how much damn music is in this set! Is there a list of the composers in English? I’m not sure if Google Translate is very accurate. I have bought this set and on the DVD there are 2 versions of the cutscene with Sakura and 2 of the one with Elise, but I can not find anything different between the 2. Am I missing Something? The Onee-san/Onii-san depending of the Avatar’s gender is the only difference i can hear. Disc 7 has 19 tracks. What’s the title of the 19th track? It’s Enishi, the Sakura and Elise duet.